Spring time is here, with all kinds of plants sticking from the ground, stretching for the sun and new life, many of them medicinal, among which some are quite edible and make a fabulous addition to one's table. Stinging nettle is one of them. What?! - you might say, - How am I supposed to put this in my mouth? Don't be too prejudiced - try this simple, yet very tasty and healthy soup, and only then make a judgment. Masha gladdened us suburbans and came to visit, to let some freshness into her lungs abused by a big city poisonous air. 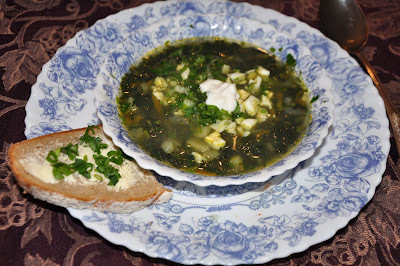 This kind of dinner together demanded something unusual and appropriate for spring, nettle soup fell precisely in this category. 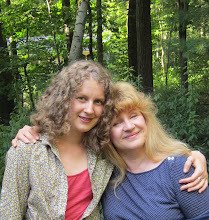 We searched the nearby forest for sprouts of stinging nettle to no avail. For some reason this very common weed is not widely spread in our vicinity. But a visit to one of our favorite farms brought more luck. The farmer, this nice fellow as busy as he was at this time of the year, kindly allowed us to wander around barns and other agricultural stuff, and even showed us some interesting plants to take notice of. When we almost gave up, we suddenly stumbled upon a spot overgrown with young nettle. We let out a cry of winning warriors and gave each other "hi five". Armed with rubber gloves and scissors, we cropped three or four big handfuls of the stinging vegetation that made approximately one third of a grocery store plastic bag. This soup was a part of our Saturday dinner together where Masha contributed nicely in preparations, to delight and joy of her old people. Bring water with potatoes to a medium boil, add salt. Saute onion and carrot in oil until tender, add to soup when potatoes are almost done. Wearing rubber gloves, wash nettle in cold water. Arrange nettle sprouts in small batches in a strainer, and pour boiling water over it until it becomes soft. After this your nettle will not sting anymore. Discard thicker parts of nettle stems, and finely slice nettle in batches. You will need about 2 cups of it, discard the rest. Reduce heat to simmer and add nettle to the soup, after this boiling is not recommended, to preserve all good that is in the fresh plant. Simmer on very low heat for about 2 minutes, put aside, and let it brew for 10 minutes. When serving, garnish with egg, sour cream, and greens, add pepper to taste. Cheap, unexpected, and extremely healthy! Since it is difficult to measure fresh nettle, the quantities of this recipe are approximate. You can make this soup thicker or thinner, put more egg or sour cream, just follow your desires. If you are a herbal tea lover, do not discard nettle leftovers after yielding 2 cups - prepare tea out of it. Add boiling water, cover, let it brew for 10 minutes, strain. It will make a wonderful hot drink, just add some honey or maple syrup. It seems great idea of using nettle in good use. We are doing best by producing the powder of stinging nettle's leafs. 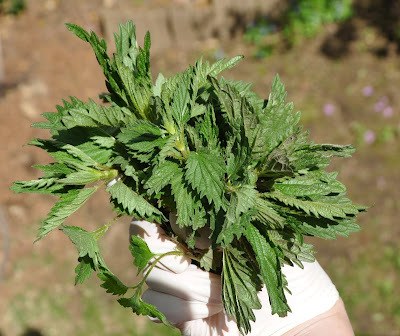 Spring is the best time to pick nettles, but it may be possible to find some young nettles even now. Let us know how it goes!